Moleskine . . . Digital? 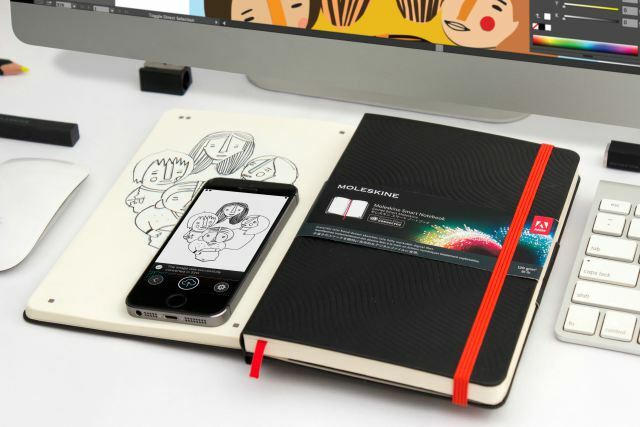 Moleskine, the Milan notebook maestros, are testing the digital waters. I suppose this is OK, though it does seem to risk brand dilution. We are so used to Moleskine meaning a notebook you sketch in (wish I did) that going digital almost seems sacrilegious. Making a note on an iPad is making a note on an iPad, whereas making a note in a Moleskine is not the same as making a note on a cocktail napkin. Anne Quito brings us the story at Quartz. In a contrasting mood, this NPR segment from Morning Edition on 27 May, 2015, includes the news that Moleskine believes that sales of their notebooks peak in the neighborhood of an Apple Store. I doubt if this has any basis in digital friendliness: more likely it is because people with money and an eye for good design will tend to buy both. It’s such a nice word, that it makes one even sadder about the passing of letterpress. We have no need to use the word flong any longer. Flong was invented in 1829 by a Lyon printer, Claude Genoux (doubtless his name would have been recorded in flong for many a UK French grammar textbook — “bijou, caillou, chou, genou, hibou, joujou, pou prennent x” as we used to be drilled. Wikipedia tells us that the derivation of the word is from flan, which does sound convincing since flong is how a Brit would have said that French word. But I wonder why M. Genoux referred to it as flan — it’s a bit of a conceptual stretch isn’t it? 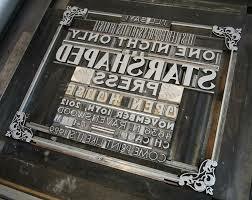 * Hot metal type for letterpress printing had to read back-to-front, so it would print right way round. I expect many people have heard about this by now: there was an item on NPR’s Morning Edition on 27 May 2015. This video explains the project nicely. Don’t despair — it’s not your speakers: the video is silent at the start. Margaret Atwood, a well-known forward-looker, has contributed the first work, Scribbler Moon. The typescripts are going to be stored in a special room in the new library now under construction in Oslo. Paterson assures us that no one, trustee or library visitor, will be able to read any of the works till the 100 years are up. From the point of view of the authors this would seem like a good deal. They are no doubt getting an “advance on royalties” now, while at the same time ensuring that they will still be being read in 100 years’ time. The project is a commission of Bjørvika Utvikling, a large development project in Oslo. NPR tells us about the magazine printed with blood. The video moves quickly from the collecting of the blood to the printing press, so it’s not altogether clear how it was done. One has to assume that blood was mixed into a red ink — on its own it couldn’t work could it? It needs to be oil-based to work in an offset environment. One of the comments links to this post from Underware which brings a cool description of how it might be achieved. 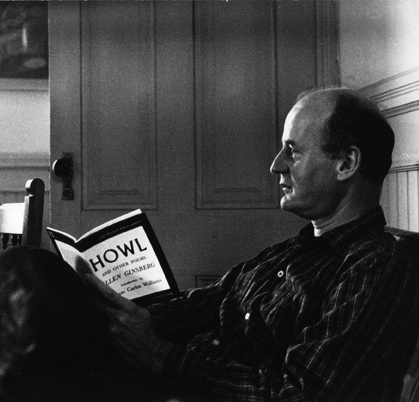 In 1955 Lawrence Ferlinghetti (1919 – ) launched the City Lights’ Pocket Poets Series. This year it celebrates with a 60th Anniversary edition of The City Lights Pocket Poets Anthology. The 60th volume in the series was published in 2011. There’s a list of the books in the series at Wikipedia. The series was modeled closely on the French Poèts d’aujourd’hui series, which was founded in 1944 by Pierre Seghers (1906 – 1987), also a poet. Poètes d’aujourd’hui, which like The Pocket Poets Series focussed on 20th century and contemporary poetry, came to an end in 1994 with #260. The company had been sold to Editions Robert Laffont in 1969. Laffont was subsequently acquired by Presses de la Cité who were in turn bought by the group Editis, now owned by Planeta. Wikipédia gives a listing of all the volumes. The Poètes d’aujourd’hui books are small almost square paperback books, 13.5 x 15.5cm (about 5¼” x 6⅛”); The Pocket Poets Series books are small almost square paperback books, 4⅞” x 6.25″. The first Pocket Poets books were wire stitched “pamphlets” but now they are conventional perfect-bound paperbacks. 500 copies of the first volumes were printed by letterpress. The making of the series was Howl and other poems by Allen Ginsberg. When this was prosecuted for obscenity, it naturally became a bestseller. The first book to be published in The Pocket Poets Series was by the publisher himself, Lawrence Ferlinghetti: Pictures of a gone world. Seghers also included a volume of his poetry in the Poètes d’aujourd’hui sees, but not till #164, published in 1967. The original story about this came from Book Patrol on 8 May. 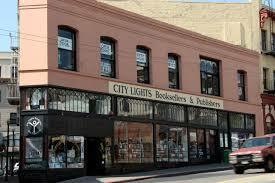 Don’t forget City Lights Bookstore, co-founded by Ferlinghetti, still going strong as an independent bookseller in San Francisco at 261 Columbus Avenue at Broadway. Their website is here. After It’s a Wonderful Life accidentally fell out of copyright it became omnipresent on American TV, especially every Christmas. The Greatest Gift, the 4,000 word story on which the film was based was written by Philip Van Doren Stern (1900 – 1984). Finding himself unable to sell it for publication, Stern used it as a Christmas card in 1943. One of the recipients of the Christmas card thought this would be an excellent film vehicle for Cary Grant, bought up the rights for RKO in April 1944 and got Grant on board. The film ended up being made in 1946 by Frank Capra for his new venture, Liberty Films, starring of course James Stewart not Cary Grant. Liberty Films was going bust soon after the picture disapointed at the box office. The company was sold, together with its small film library which was in turn sold to a succession of companies. While one of the sales was under way the paperwork for copyright renewal for It’s a Wonderful Life didn’t get filed. Thus the film fell into the public domain in 1974, which is when it became a “success” being shown again and again (for free) on television. End of story you’d not unreasonably think: there’s no way back to copyright status from being in the public domain. But . . .
There’s copyright in the derivative work, the movie, and there’s copyright in the story on which it was based. In 1990 the Supreme Court had judged that the underlying rights in an original book could supersede the rights to the movie in a case involving Rear Window. The judgement hinged on the failure of the original author to renew copyright — his death had unfortunately gotten in the way of his doing so. It’s a Wonderful Life‘s owner, Republic Pictures Corporation, saw the opportunity to use this judgement to scare off the “copyright infringers” who were showing their movie without paying them anything. They owned the movie but also the copyright to the original story from which it had been developed. Just to be sure, they also bought up the copyright to Dimitri Tiomkin’s score. Republic Pictures notified all television networks to stop the playing of It’s a Wonderful Life without payment to them: and none of the networks challenged their claim. One might well believe that Republic’s claim would not stand up in court: after all in this case the critical element of the author’s dying before he could renew copyright was not the case. Networks must have decided that the cost of a suit would be more than the benefit from playing the movie free of charge, so Republic succeeded in rescuing the film from the public domain. Ironically the movie’s success was almost entirely due to its period in the public domain, and Republic Pictures is now able to pick up the benefit. The video at the top of this piece is 21 minutes long, but is actually very interesting, and well worth watching. Initially I thought John Hess’s way of speaking might drive me crazy, but his precise delivery is actually appropriate to the legal subject matter. The whole thing is fascinating, and a model of clarity. Ink, Bits, & Pixels brought us the story. The Laurence Hutton Collection of Life and Death Masks at Princeton University Library is extensive if a bit gruesome. 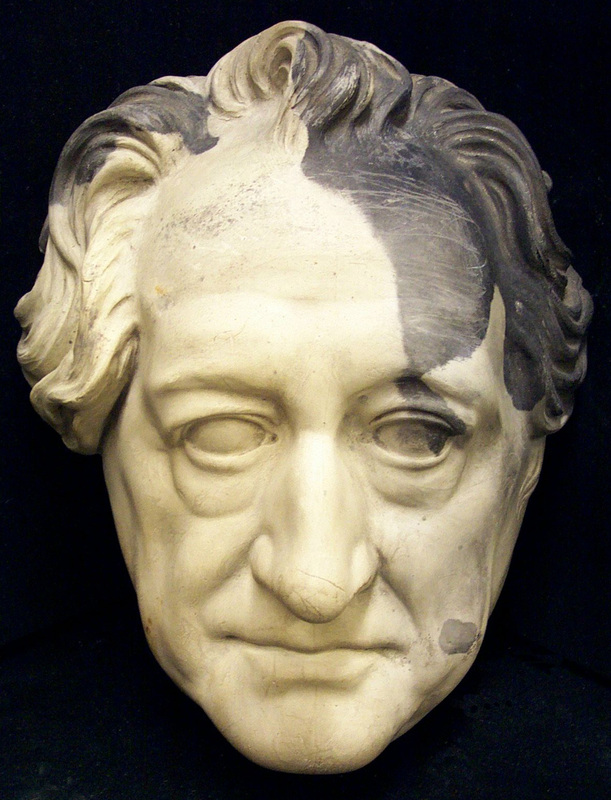 Here for example is Goethe. A cast of Robert Burns skull doesn’t really tell you a lot, but there it is. S. T. Coleridge looks suitably grumpy while Dante and Sir Walter Scott look really disapproving of the whole process. John Keats appears to be caught in the act of composition. Laurence Sterne and Jonathan Swift seem to be in the middle of telling good stories. 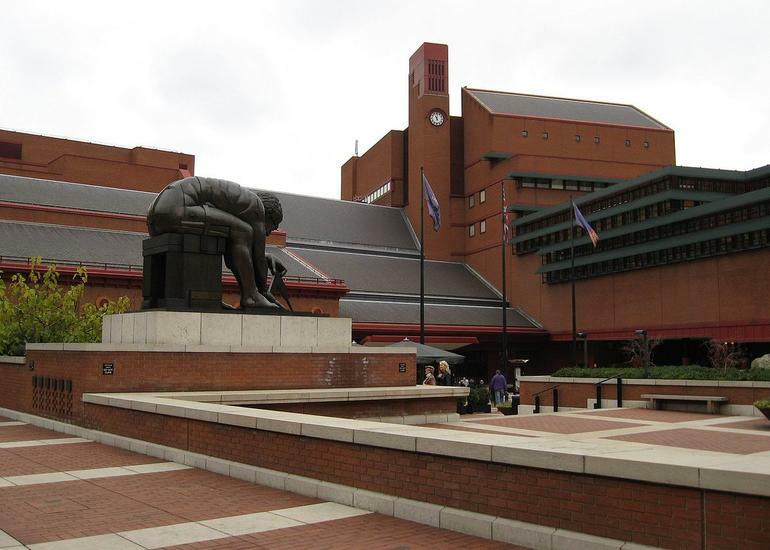 It was an appropriately dull day in London when they took this photo of the British Library, which is on Euston Road between Euston and St Pancras. You want to go right in and start reading. In January this year The British Library published its vision document Living Knowledge, laying out its plans for the next decade which will take it up to its half-century in 2023. Richard Price has a nice piece about it in Camden50. There’s a link in his piece to a PDF of Living Knowledge. Here is a video of an inspiring speech by Roly Keating, Chief Executive of The British Library, introducing the report and speculating on the role of the library in a digital age. This is long (over an hour) but worth the commitment. Does the library make sense in the age of Google? he asks. Unsurprisingly he is able to answer yes (Google is about to move to a site nearby, and Peter Baron their local Head of Communications is on hand to ask Keating some questions after his presentation). Legal deposit has been extended to all websites with UK domains, so not only does the Library hold 9th century printed books, but it is also archiving last night’s (British) blog posts. Custodianship, Research, Business support, Culture, Learning and Education, International cooperation are the six major aims of the Library, with an overarching commitment to the retention and protection of knowledge within the UK. The London building is the bit everyone knows, but like an iceberg, it has hidden depths. Boston Spa in Yorkshire, and immense facility, is the mechanics of document search and storage. It is scheduled to expand and permit cooperation with other organizations. This BBC video of the Newspaper Building at Boston Spa gives you a quick impression of one part of the site. I wrote about last year’s Association of Writers and Writing Programs Conference in Seattle. This years was in Minneapolis — not nearly such a weather welcoming venue. The Association has a round-up at its site. Next year’s meeting will be in sunny LA. Probably less “traversing the streets” there, at least on foot. Ten minutes worth of requests from readers in the British Library’s book delivery system. Splendid variety. Happy to see The New York Review of Books 1963 as one of them. London is a man’s town, but women go there, 1930 sounds intriguing. One hopes that none of them were requests filed by Mr Bean.